ProKNOWS® professional clown noses are the best in the world. Each one is hand made in the USA. A shiny gloss red outside covers a soft form-fitting foam interior that offers the ultimate in comfort and more gluing surface. 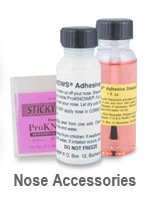 ProKNOWS® professional clown noses are light-weight, real to touch and long-lasting. Apply your ProKNOWS® with genuine ProKNOWS® adhesive that is safe for your skin and strong enough for all day wear. 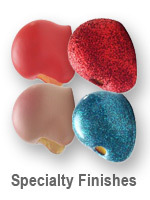 The standard finish is glossy red, but ProKNOWS® noses are available in auguste w/ airbrushed blush, matte red, assorted optional colors, and glitter, either gumdrop finish or glazed. We recommend that you use small sharp scissors to custom fit the contours of your clown nose.